So, as you may know. I've been wanting to do board and batten in my entry way and front room for awhile now. I finally got all the supplies, but when it came down to it, I started getting a little anxiety about how it was going to turn out. It was my first time, and it was in the most important place of my house. The first place guests see and sometimes the only place guests see. So I decided to try it out in my upstairs bathroom first. Ya' know, just to make sure :) And mainly cuz the hubs was having more anxiety about it than me. haha. Anyway. So I really never had any plans to redo this bathroom. I never really liked it, but no one ever used it so it didn't matter too much to me. So this was like on a whim makeover :) Those are sometimes the best though. Mostly because I didn't have anything planned for it or money stashed away to do it, I had to find a way to make it work on a very limited budget. The board and batten solved the whole 'darkness' issue and was the first thing to go up! It only cost me $11 to do. Not bad, huh? I'll show you how I did it for so cheap in an upcoming post. UPDATE: Click here to see how I did the board and batten! Once the board and batten was done, I couldn't not do other updates to the bathroom. All it took was a new shower curtain, which I made from normal curtains. You can see the post about it here. Some new pictures and accessories. I got these frames from Ikea and just printed off some black and whites of a few photos I took when visiting San Juan last fall. And a little clear storage in the form of glass containers. $7 - Soap dispenser from Ikea to match the glass containers. Everything else, I had on hand. I can't believe the difference in here. It so much brighter. The board and batten did a lot to add to the brightness, but a lot of it came from the shower curtain itself. It makes the room feel so much taller to. I love it! Its quite a shame actually that no one ever sees or uses this bathroom except for the occasional guests. But on a good note, the board and batten was a success! The hubs has approved it for the entry way and front room...and so have I :) I think I might make a few tweaks, but we'll see if that happens or not. I'm super excited for it! I just wish I could blink and have it all already painted for me :) haha. One can wish, can't she? I love how you did the board & batten! It looks like you spent 100s of dollars instead of $60. Great job! Hurry up and tell me how you did the board & batten so cheap! Hurry hurry hurry! wow that looks awsome! I have to have you come decorate my house!!! Wow! What a difference! It's feels so fresh and clean! I'm with Jennifer. How did you do the board and batten so cheap?! I want to know. I love your makeover. I am in love with your shower curtain. It's gorgeous! The white looks so soft and pretty! I can't believe the board and batten were so cheap! This looks so awesome! 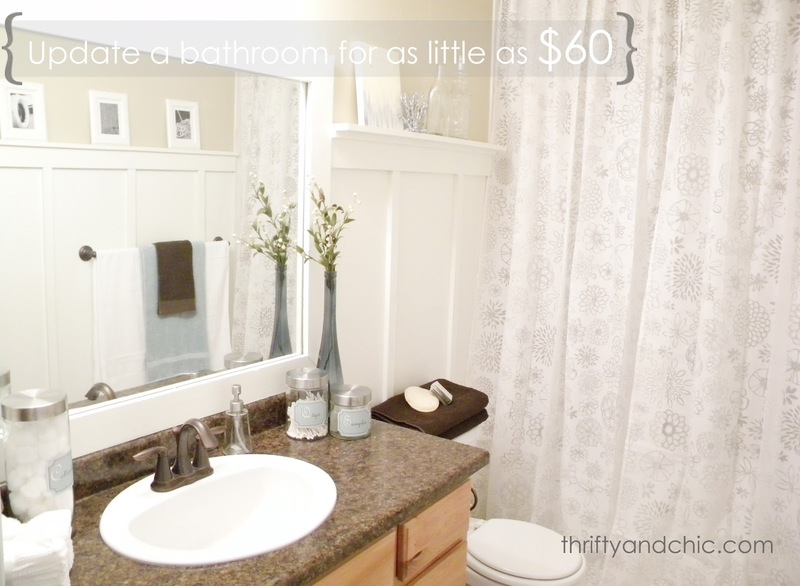 Our front bathroom doesn't have a window either and I have been thinking of the board and batten to brighten it up. I think you just made up my mind;0) I can't wait for the tips!!! Wow it looks amazing now. All the new colors are wonderful! That's an amazing price! Can't wait to see how you did the b&b so cheap. What a transformation! LOVE the white and softness. The board and batten is stunning! Fabulous job... lots of inspiration here! Thanks for sharing! It's so beautiful!! Your first board and batten project came out amazing!! Now you HAVE to do it in your entryway! 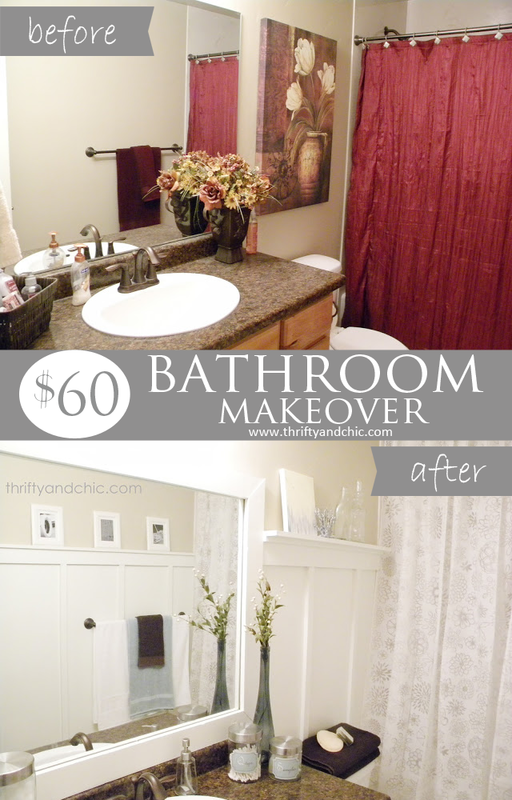 Wow, I'm still in shock over the $60 price tag of this makeover- unbelievable! You did so good!! btw I just featured this on my blog:) I always love an inexpensive but high-impact makeover- super inspiring! This is great...its has me thinking about my ever so plain and very white hallway.....this is great thanks! It looks awesome. I'll be waiting on the follow up post to see how you did the board and batten so cheap. I want to try it in my daughter's bathroom. This is amazing and all for only $60. Good Job!! This turned out fabulous!!! I think your first board & batten project was a success! That is such a pretty end result! I love your new bathroom look! Brilliant! Good for you...I love it and I'll bet it's going to be gorgeous in your entryway. Beautiful transformation! I have been wanting to do board and batten somewhere in my house and I had not idea it was that inexpensive! What have I been waiting for??? It looks beautiful! So bright, fresh and spa-like! I bet the board and batten will look great in the entry also. It looks amazing!! Can't wait to hear how you did the board and batten . . . and would also like to know how you did the mirror. this is beautiful and i love the frame around the mirror too! I just love board and batten, we did it in our mud room. This looks so fresh, bright and beautiful! I am a big fan of board and batten too, and love how it adds so much charm and character to a space. And the framed mirror looks awesome! Hi! I found you via Better After Blog. 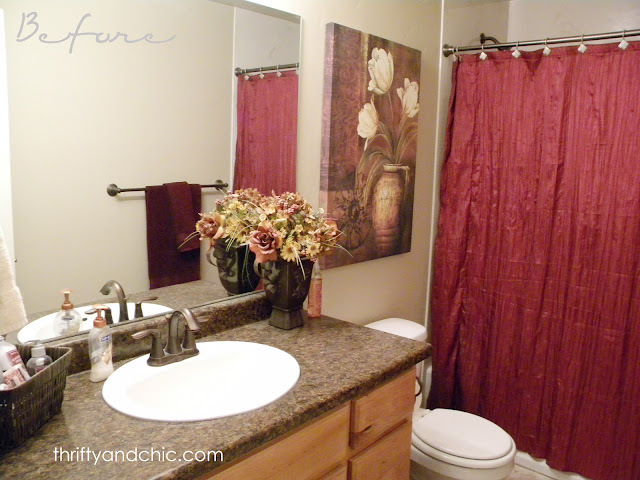 I have the exact same bathroom and have been mulling over how to do it because I find it soo dark in there. Right now I have creamy beige with dark browns :/ but I didn't want to go white and boring...but this batten lark makes it so NOT boring! I think I may have to give it a whirl...thank you soo much for sharing and inspiring! WOW! looks amazing and great pix!!! It looks fabulous! What a great makeover. Can't wait to read how you did the board and batten! absolutely fabulous! Great job!! I kept scrolling back and forth going "before, after, before, after"! I love it! Do you have a tutorial on the DIY mirror frame? I love your decorating style -- so calm and serene! WOW Brilliant job. You inspired me. I am going to renovate my bathroom, too. I am so glad that I have found your fantastic photos. I will steal some of your ideas. Best regards! I love the way this looks! We have a bathroom with the exact same layout. But I am not very good at this type of thing, so here's my question: How do you cut the places out of the board where the towel rack and the toilet plumbing at the back of the wall are? I appreciate guidance before undertaking this project.